I use Alpha-Lipoic Acid by Progena to help with chemo induced neuropathy in my feet and hands. It helps to decrease the pain and "needle" feelings. Alpha-lipoic acid is widely recognized as a powerful antioxidant that features several unique qualities. Antioxidants are used to neutralize free radicals‚ which are harmful particles that can be found in food or environmental pollutants; they often wreak havoc on your body’s cells while causing damage to internal organs and tissue. What makes alpha-lipoic acid different than other antioxidants is that it works to recycle vitamin E and vitamin C‚ nutrients that also have antioxidant properties. Alpha-lipoic acid can also increase glutathione levels‚ therefore protecting both nerve and brain cells against oxidation damage. Glutathione is such an important antioxidant because it’s actually found in the liver in addition to other cells‚ making it easier for your body to neutralize free radicals. The liver is responsible for filtering and cleaning the blood as well as synthesizing protein. Another unique characteristic of alpha-lipoic acid is that it’s both water- and fat-soluble: this means that it’s able to travel into and protect a large range of cells‚ including those in the lungs‚ heart‚ muscles‚ and many other organs. Due to this‚ alpha-lipoic acid also protects brain and nerve tissue‚ unlike most other antioxidants. Alpha-lipoic acid has also been used to decrease the symptoms of type 2 diabetes in some individuals‚ because it’s been associated with improving insulin resistance while helping heal the nerve damage sometimes caused by diabetes or certain cancer treatments. Because of its link to helping with nerve damage‚ there is some evidence that alpha-lipoic acid might also help lessen the symptoms of dementia. 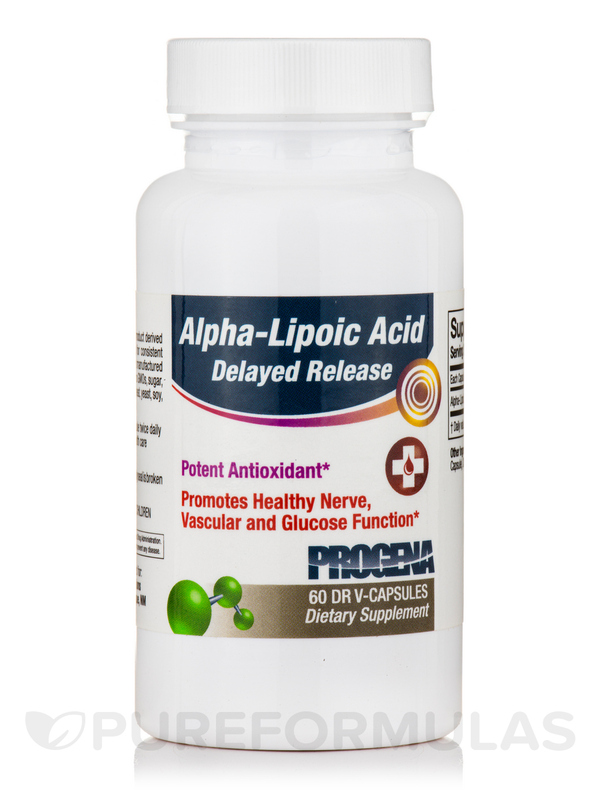 Progena’s Alpha-Lipoic Acid Sustained Release Tablets comes in a 60-tablet bottle. By taking the recommended dosage of two tablets per day‚ this bottle will last you roughly one month. This product doesn’t contain sugar‚ starch‚ salt‚ artificial coloring‚ corn‚ wheat‚ yeast‚ soy‚ or milk. Other Ingredients: Vegetable cellulose (vegetarian capsule)‚ dicalcium phosphate‚ magnesium stearate and silica. Contains no GMOs‚ sugar‚ starch‚ salt‚ artificial colors‚ and no corn‚ wheat‚ yeast‚ soy‚ milk or gluten. One capsule twice daily with food or as directed by your healthcare professional. It helps when taken every day. If I run out it takes a day or so to build back up into my system. So, I'm considering putting it on an automatic refill.